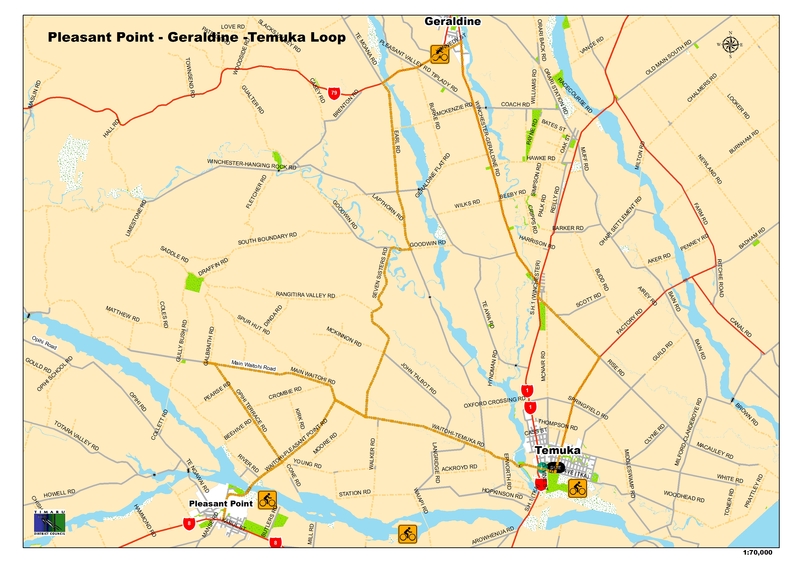 This ride takes in several picturesque and historic South Canterbury townships – Temuka, Winchester, Geraldine and Temuka, starting at and returning to Temuka. The township of Temuka is a popular relaxation stop with visitors and locals alike, with its close proximity to rivers and plenty of opportunities for outdoor recreation and camping. Temuka is known for its antique and collectible stores and of course is the home of the famous Temuka Pottery. The area was also once home to pioneer aviator Richard Pearse, known by locals as the man who flew before the Wright Brothers, in early 1903. The name Temuka is believed to be a derivation of the Maori Te-umu-kaha "The Place of Hot Ovens", in reference to the large eathern pits used traditionally by Maori to cook food from the many cabbage trees that used to grow in the area. 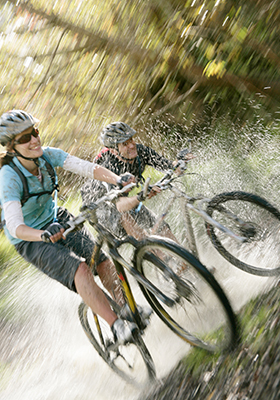 Find out more about things to see and do in Temuka here. Across the SH1 bypass you will see the historic Temuka Saleyards, one of the few remaining of its kind in New Zealand and still in active use by the farming community. Nearby is also the historic Temuka Museum, housed in the old township courthouse. Situated just off the main street, the ornate Temuka Museum is one of New Zealand’s finest small-town public buildings, built in the early 1900’s. Continue North along SH1 for approx. ½ km. Turn right into Richard Pearse drive. Turn left into Factory Road, named after several dairy factories that used to be housed in the area. Temuka is now the home to the Fonterra Dairy factory, one of the largest of its type in the Southern Hemisphere. Turn left into Rise Road and follow the road until you connect with SH1 at Winchester, a small township with a history as a prosperous rural centre, founded by one of Timaru’s early settlers who arrived on the pioneer ship Strathallan in 1858. In Winchester turn left down the Winchester – Geraldine Road, continue all the way down this road into the boutique village of Geraldine, one of the most popular stopping points for tourists en route between Christchurch and Tekapo. Spend time browsing around Geraldine, enjoy the genuine New Zealand country town atmosphere, delicious locally produced gourmet food, great shopping for high quality gifts, souvenirs and merino wear. Also offering plenty of adventure activities nearby, Geraldine is well worth a return visit; find out more here. In central Geraldine, turn left off Talbot St into Cox St. Here you will find Geraldine’s Four Peaks Plaza, where you can enjoy shops, cafés and sample some of South Canterbury’s best gourmet produce, and the Geraldine Visitor Centre, where the friendly team can help with information, maps, brochures and directions to the many Geraldine activities and attractions on offer. Continue along Cox St / SH 79, crossing Speechly’s Bridge, named after a local family who farmed nearby in the early days of the area’s history. Veer left into Seven Sisters Rd, named after the seven hills in its course. Turn left into Waitohi-Temuka Rd – follow this all the way back to Temuka and your start point.